There can seem to be a bit of a mish-mash of signs on Irish roads, with signs of various colours and styles sharing a single signpost. Yes, it can be confusing! Once you know how to decode the signs though, all becomes clear. 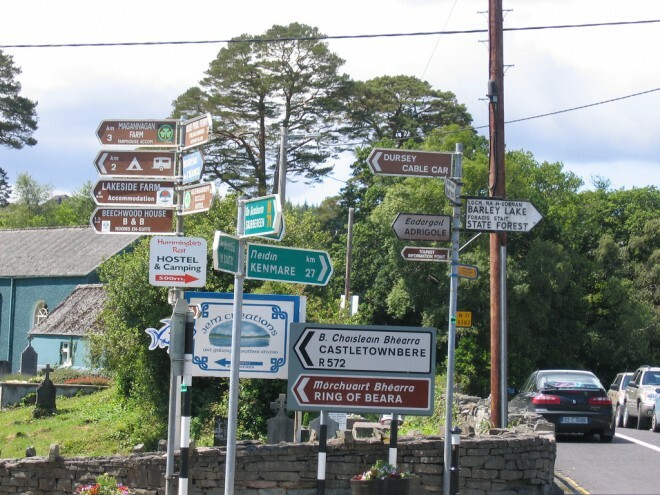 While square or rectangular brown signs, which are informational, are usually separated from official directional signs, this isn’t always the case, as this somewhat chaotic signposting in Glengarriff shows – a testament to the fact that it IS possible to provide too much information! Knowing this, if you now look at the jumble of signs in the image above, they should start to make sense. Official signage is always bilingual, with the Irish version in italics over the English one. 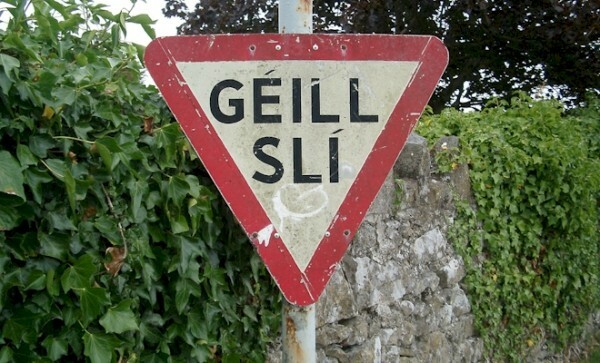 The only exception to this rule is in Gealtacht, or Irish speaking, areas, where signs are in Irish only. Knowing the way signs are formatted means you can get a lot more information from them. In the one on the left, it is a sign on the N77 road, in the direction of Durrow. The destination in brackets means it is also the correct road for Athy, but you will have to make a turn somewhere ahead to get to Athy. You are 25km from Durrow and 46 km from Athy. Traffic lights appear in two basic guises. Standard traffic signals have a sequence of: Red » Green » Orange » Red. The rule with an orange light is that you must stop unless it is unsafe to do so. Note that unlike the situation in the US and Canada, where you can turn right on a redlight at a junction, you cannot turn left on a red light in Ireland. In spite of the fact that legally an orange light means ‘stop unless it is unsafe to do so’, the reality is that Irish people tend to drive through much of the time. Many law abiding visitors, on obediently stopping when the lights go orange, have found themselves rear-ended by a motorist behind who was just speeding up to “make the lights”. Pedestrian lights are often not at junctions, but at places where pedestrians frequently cross. Their cycle is: Green » Orange » Red » Flashing Orange » Green. The flashing orange light indicates that pedestrians still have priority but that motorists may proceed if it is safe to do so. No Parking and Parking permitted. Other signs will indicate specific local parking regulations. No right turn and right turn only. Similar signs apply for left turns or proceeding straight ahead. Signs at junctions – Stop or Yield to traffic on the road you are meeting. The nature of an upcoming junction. Thicker lines indicate the road with priority. 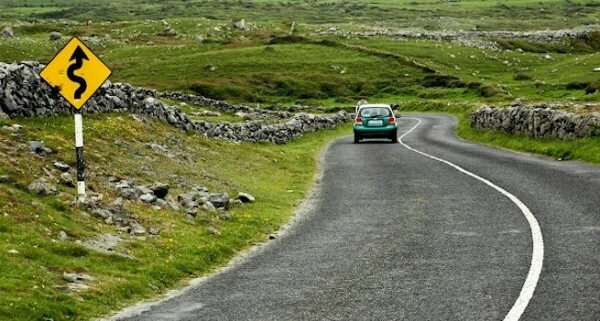 Warning and information about the nature of bends on the road ahead. Warning and information about undulations on the road surface ahead. Beware slippery road surface, unguarded pier or falling rocks ahead. Yes, there are unguarded piers in quite a few parts of Ireland! Watch out for, respectively, children crossing, horses using the road and road works. Steep incline or decline in the road ahead. Few are as steep as these signs would suggest. Firstly, thank you for providing this resource, it is very helpful for us overseas travellers planning a trip to Ireland. However a couple of point regarding this Irish Road Signs & Traffic Signals page if I may. 1. In the section on traffic lights it states that the sequence is Red » Green » Orange » Red but the image display is Red » Orange » Green » Red which is obviously quite confusing. Hope you find this helpful, it is not meant as a criticism.